Australia’s best resorts and hotels? That’s a big call – take a look at this piece in this weekend’s Sydney Morning Herald for the top places to lay your head in Australia. 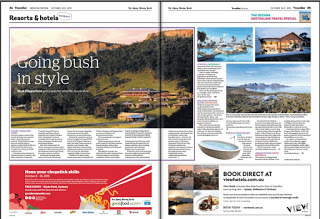 The writers named luxe safari lodges, industrialia in the Tasmanian wilderness, island stays and beach eco-resorts. On an urban note, I tipped the seven Art Series Hotels in Victoria and South Australia, because the art is sublime, they’re so much fun, and who doesn’t like to wake up with Ned Kelly pointing a gun at your head? You can read the story in full here, in the Sydney Morning Herald’s Traveller section.